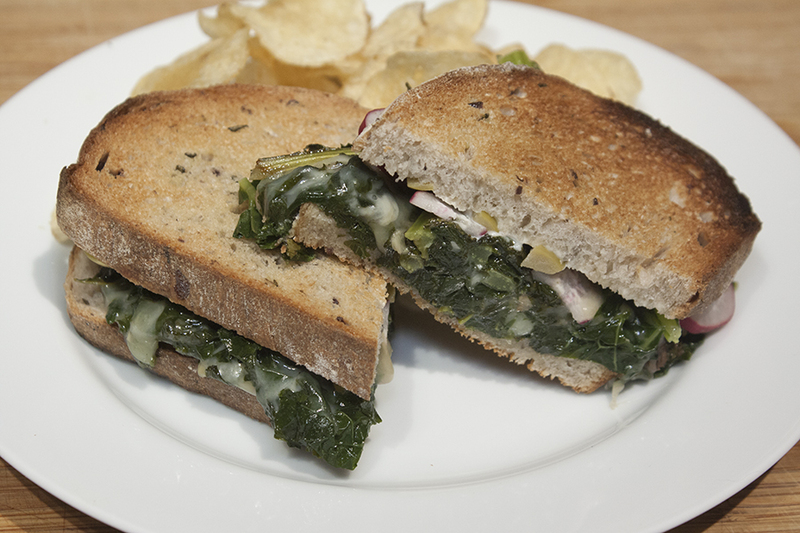 We wanted something quick and easy for dinner Wednesday night and decided to make Food & Wine’s Garlicky Kale-and-Provolone Grinders. Here’s how Tony did it. There’s minimal prep involved with these grinders, as all you need to do is tear the kale into large pieces and mince the garlic. If you’re using the garnishes (and you should! ), you’ll also need to slice up some radishes and olives. I added my own twist to this dish by substituting olive bread for the ciabatta. I thought it would be nice to toast the bread a bit, so I brushed one side of each piece with olive oil and put the bread under the broiler for a couple of minutes. Keeping one side untoasted made it easier to spread the mayonnaise and arrange the radishes slices and olives later on. The cooking involves with this dish is pretty minimal too. I sautéed the anchovies, garlic and kale together for about 3 minutes until the kale was soft. (You can leave the anchovies out if you like, but they do add a lot of flavor.) I added a cup of water (we were halving the recipe, which calls for two cups), covered the pan, and cooked for about 15 minutes until the kale was nice and soft. I layered five slices of provolone on top of the kale, covered the pan, and cooked for 2 more minutes to melt the cheese. The final step was top assmeble the sandwiches. I laid the bread tasted side down not he cutting board. For each sandwich, I spread the untoasted side of one slice of bread with mayonnaise. I put half of the olive slices on each piece of bread and then spread out half of the radish slices over the olives. I used a slotted spatula to transfer the kale with cheese out on the pan an onto the untoasted side of other slice of bread. I then very carefully put the sandwiches together. As you can see from the photo above, the sandwiches were very pretty – brown and toasty on the outside and lush, dark green on the inside. The kale was cooked perfectly: not too bitter and not too soft. The flavor of the anchovies came through without being overwhelming and the creamy, melted cheese was a nice counterpoint to the crisp, toasted bread – and the crunchy potatoes chips! The anchovies in this dish almost stumped our friends at Wine by the Flask, but they directed us to a wine we had never had before: a 2012 Cuvee Marie Juracon Sec. The wine was a little bit acidic and a little bit minerally and a perfect match for the bold flavors of this dish.